Backstory: TBH, I wanted a Roman Holiday pic but the outfit didn't come together like I expected and definitely did not photograph how I expected. I was also having the worst allergies of my life so my face was looking a little swollen and did not look good in smiling photos. I instead settled for this side shot that was saved by the caption. Luckily I watched The Lizzie McGuire Movie in preparation for this trip because it gave me a fire caption to work with. I would not have otherwise posted this photo. Like Analysis: 80 likes is pretty good, most likely because this was my first Italian Instagram post and was the first indication to my followers that I was, in fact, in Italy. Half of the likes were probably for that reason, and half were for the caption. The outfit honestly looks bad and you can't even tell that I'm wearing a neck scarf like Audrey Hepburn in Roman Holiday. I could have gotten more likes if my hair was in a ponytail and also maybe if Andrew was in the photo. Backstory: Honestly I paid for this tour of the Colosseum that gave you special access to the arena floor so I had to make it worth the money by posting this photo. We just walked out onto the floor and while the tour guide was talking and people were listening I forced Andrew to take this photo. I don't look the best but it was the best of the photoset that I had to work with. Plus again, it's mostly the caption that makes this. I considered the basic caption "brutus is just as cute as caesar" but I decided to instead go for a deep cut that might have cost me a few more likes than usual. It's the beginning of the rant though so any run-of-the-mill Mean Girls fan should be able to understand that. Like Analysis: 88 - more than Trevi fountain despite my perception that not as many people would understand the caption. 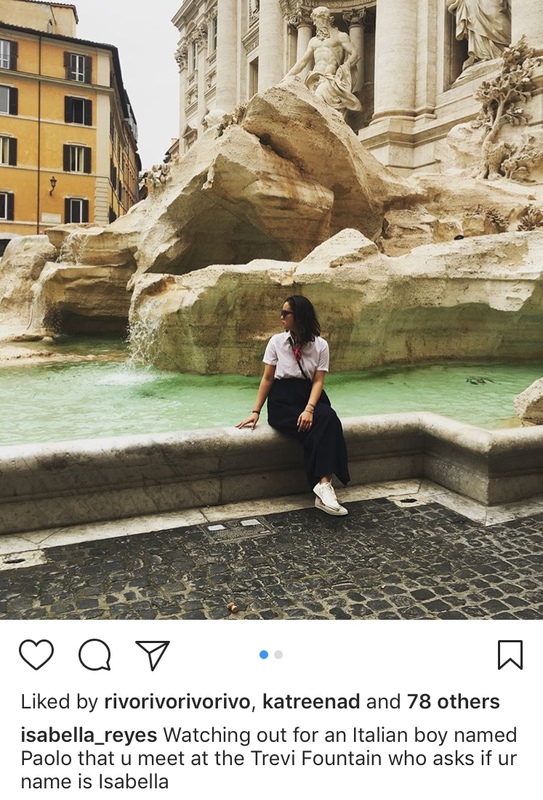 Maybe people didn't understand the Lizzie McGuire caption either. Who knows who my audience really is these days. That's actually more likes than I was expecting for this look, only because I don't look my best. These jeans don't photograph very well when I have shirts tucked in. Plus this graphic tee backfired on me and actually made me look like a real loser when walking around Italy. Backstory: I almost posted a photo of just this cute lil bag I got with the navy maxi skirt and a plain t-shirt I was wearing. 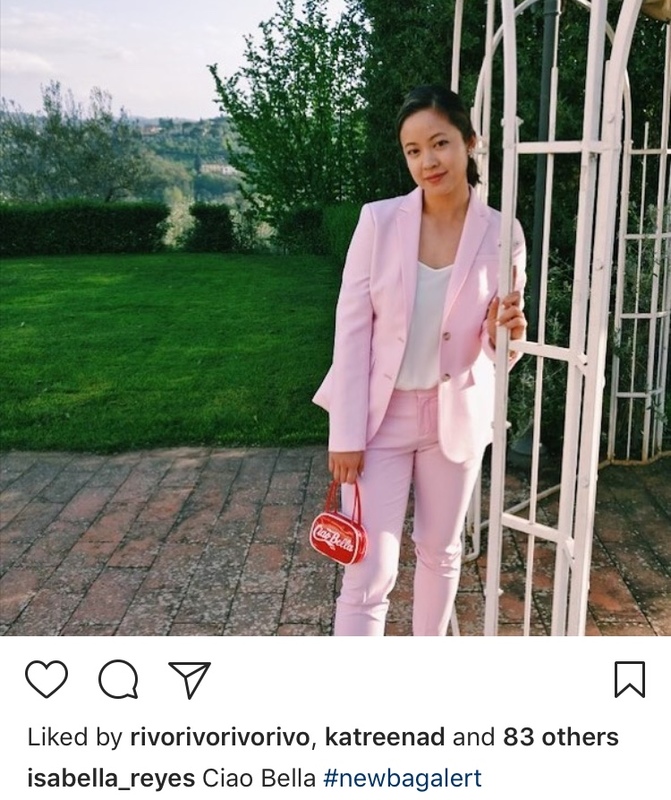 Luckily I realized that it would colorblock perfectly with my pink pantsuit that I was planning to wear later that day, and I saved it for this insta. I convinced my cousins that we needed a photoshoot and I told one of them that I needed a full body pic of the pantsuit with the bag in clear view. They got me. 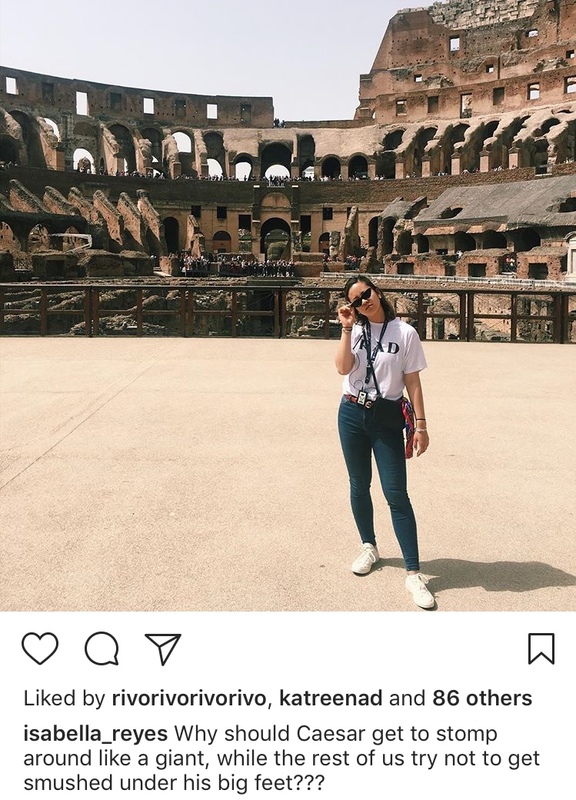 Like Analysis: Fewer likes than the Colosseum post, which is shocking, but way more positive comments both on the photo and verbally, IRL. Probably the most comments I've ever gotten on a photo. So why don't the likes reflect this? The caption was lazy, but also I don't know what else I would have captioned it. It seemed to fit. I'm still happy with this post even if the likes don't reflect its success. Backstory: My cousin's wedding had a dress code of "floral maxi dresses" and I bought this dress to wear back in September. It was $33 on ASOS and I couldn't pass it up. I think Tahani also wore it on an episode of The Good Place. I was slightly concerned that it was too white, but I sent a photo of it around and no one seemed to think it was too outrageous. I thought it was the perfect romantic Italian floral maxi for the occasion and my followers seemed to agree. Like Analysis: I think this 110 is the most likes I've ever gotten on a photo. I would attribute it mostly to the dress and the way I'm holding it. The caption is basic, but I was thinking about it almost the whole time. 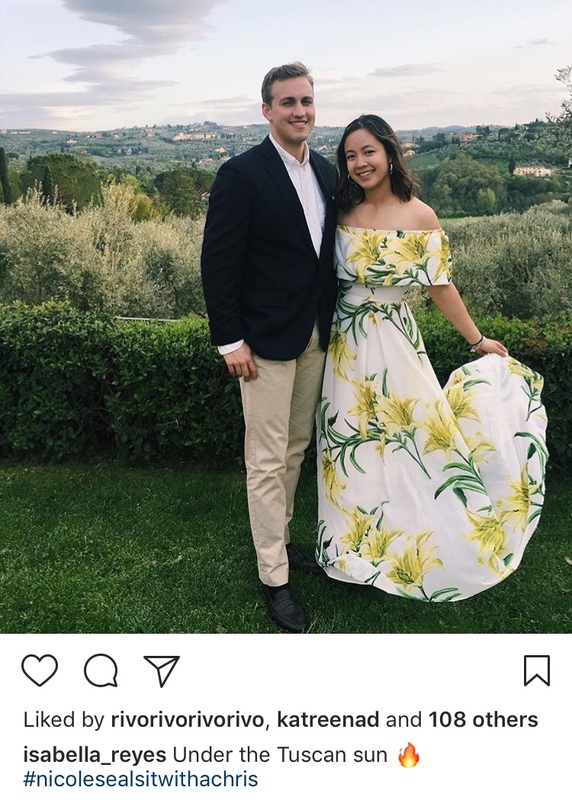 I checked the wedding hashtag and ANOTHER PERSON had the same caption (without the flame) which made me feel even more basic. It's okay though, because obviously it was a good caption for the setting. The $33 were well worth it. Backstory: This is the photo I had planned the longest. 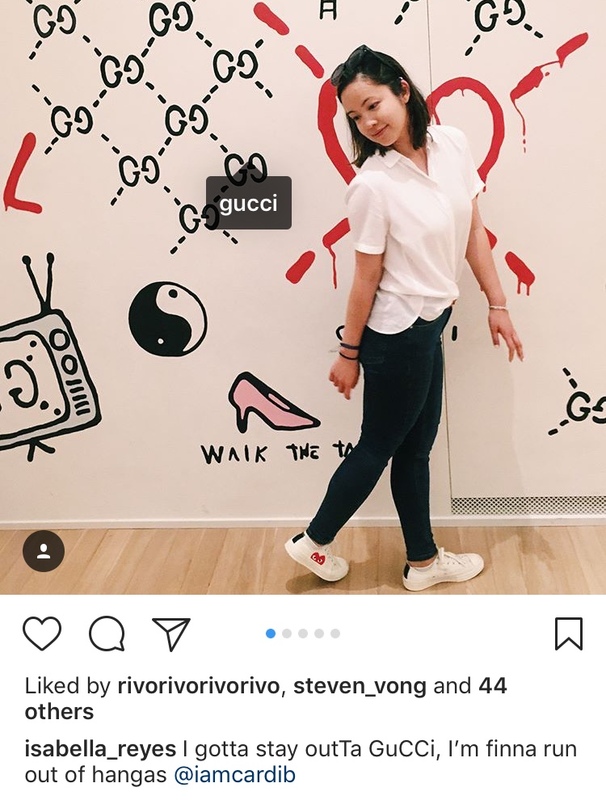 In the weeks leading up to our Italian trip, I obsessively checked the #guccigarden hashtag and the location tag to see what was up with the Gucci Garden. I mostly wanted to see how much their merch cost, but I ended up getting a lot of insta inspo. The visit was 50% to buy exclusive merch and 50% for this instagram. Like Analysis: Very clearly the least amount of likes of all of my Italian photos. I think it's due to the caption and the content. People that follow me are not into Gucci, and also probably not into deep cut Cardi B lyrics. Ever since I heard the song Drip, I knew that I was going to post a photo from Gucci Garden with that as the caption. Unfortunately this has not proven to be one of my best plans. 44 likes is actually still a lot, comparatively, with my other photos, but when the other Italian instagrams averaged over 80 likes, it's a clear disappointment. 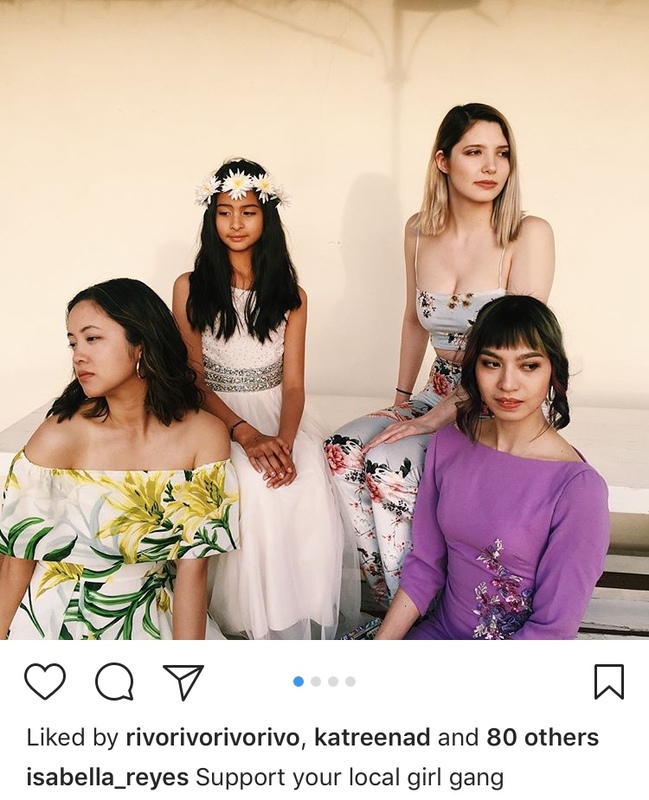 Backstory: My cousins and I had photoshoots both days of wedding celebrations, i.e. the pre-wedding dinner and the actual wedding day. I orchestrated these shoots so I couldn't let all these photos go to waste. It's amazing how different we all look when our moms are all sisters. Clearly our dads all have strong genes. I also was just getting post-happy while on my trip and wanted to post more photos. Plus I was being shaded for posting too many solo photos of myself and making it seem like I was just traveling by myself. Like Analysis: I posted this around the same time that I posted my Gucci Garden photo, which might also explain the lower number of likes on that photo. This is a set of 4 photos, two of me in the floral maxi and two in the pink pantsuit. I'm wearing the same outfit as the last two photos! I can't believe I posted this! Clearly my followers didn't care and they liked this photo a lot more than the Gucci one where I was wearing a totally different outfit. I think it performed well because I don't post photos with other people often and people could feel my love for my girl cousins. 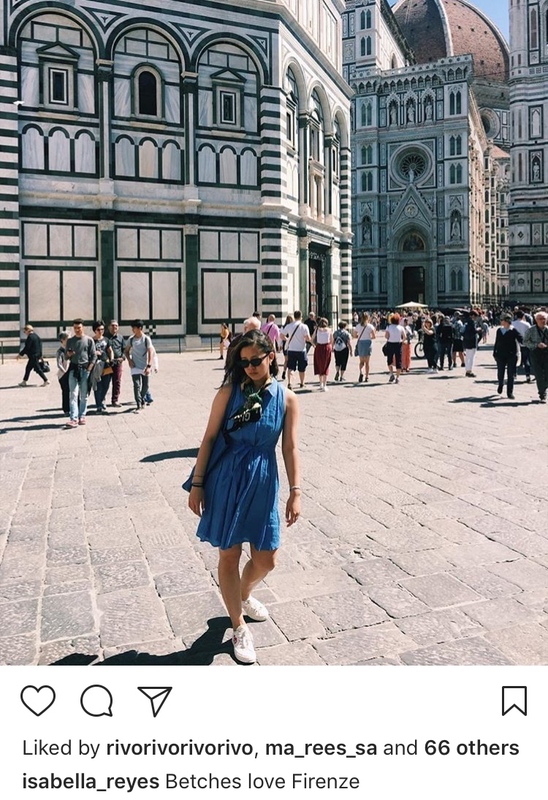 Backstory: I needed to post a photo in the recognizable city of Florence. I really love the design of the duomo and the arrangement of the marble tiles, so I figured it would be a duomo pic, but it's visible from so many places, the question was what kind of photo I would post. I had bad allergies again this day so I didn't actually really have that many good photos to choose from. I also started getting picky that I didn't want people in the background behind me, but beggars can't be choosers. It was packed there. I think this photo looks cool, my outfit looks good, and the duomo looks good and colorful. Like Analysis: Hmm 68. Not as much as I would have expected from the aesthetics that I see in this photo. The caption is probably what caused people to pass on it. I didn't really think about the caption too much. All I could really think about while I was in Florence were how many American girls there were (presumably studying abroad). Also if people could see that that scarf says "GUCCY LOVED" then maybe I would get more likes. I'm obsessed with Gucci with a Y, so much so that I bought a scarf that says it in the Gucci Garden. 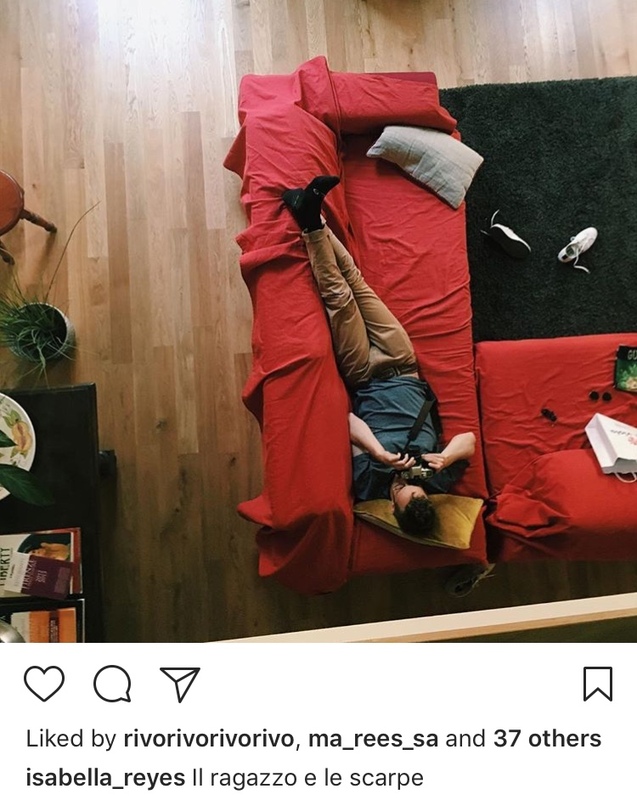 Backstory: The air bnb we stayed at in Florence had a lofted kitchen that overlooked the living room where Andrew was resting. He was taking a photo with his real camera and I took a photo of him on my phone from the kitchen. That's all. I just thought it looked cool and had cool lighting so I posted it. Plus it looks like my shoes were artfully arranged in that corner. Like Analysis: Oops, this one actually got fewer likes than my Gucci Garden photo. I don't get it because it's a cool photo. I sort of figured this would happen though, because followers don't tend to like photos of settings or food or photos that I'm generally not in. Maybe it's because they follow me to see pictures of me, not pictures of Andrew. Whatever. Now that my trip is over, I don't know when I'm going to post another instagram. I can't wait to plan another trip or just have any occasion to plan outfits and instagrams for.